Managing and running an independent, high producing group or team is easier said than done. It’s a multi-faceted task that requires, among other things, empathy, emotional intelligence, and strategic thinking. It’s a job that places you, the manager, in different roles, going from coach and mentor in one instance to disciplinarian in the next. Management and leadership are not subjects that have been lacking in observation and exploration. There are hundreds of competing theories on what makes a good manager, some of them produce results and others don’t. Luckily, Harvard Business Review packaged the 10 best articles published in their magazine into an easy-to-read book that offers incredible and deep insight on what management styles work in which situations and how to build a better environment to meet your objectives. I’d like to share eight quotes, one from each article, that I found especially powerful. — p. 6 (Leadership That Gets Results); bolding mine. — p. 37 (One More Time: How Do You Motivate Employees? ); bolding mine. The implication is that the answers to ‘what makes my employees unhappy’ and ‘what makes my employees happy’ are separate and distinct, and by focusing on solving the issues that make them unhappy you won’t necessarily be creating an environment that makes them happy. “The [set-up-to-fail] syndrome usually begins surreptitiously. The initial impetus can be performance related, such as when an employee loses a client, undershoots a target, or misses a deadline…[T]he syndrome is set in motion when the boss begins to worry that the employee’s performance is not up to par. — p. 52 (“The Set-Up-to-Fail Syndrome“) ; bolding mine. How do you get out of the vicious cycle? The authors, Jean-François Manzoni and Jean-Louis Barsoux, recommend that the supervisor and the employee have a discussion in a neutral location to go over expectations and objectives. And if the supervisor wants to increase direct supervision, this should be communicated with clarity, explained, and the increase should be temporary. — p. 78 (“Saving Your Rookie Managers From Themselves“); bolding mine. The article also mentions that many higher level managers often let rookie managers learn the job on their own, which fails more often than it succeeds. Like all employees, freshman managers need training, direction, and feedback. — p. 109 (“What Great Managers Do“); bolding mine. Marcus Buckingham, the author, goes on to explain by example how great managers are able to flexibly mold the positions in the company around the strengths of the employees, which gets more out of the team at a lesser cost. First, you maximize each individual’s strength by giving them a scope that fits those strengths. Second, you save on firing, hiring, and re-training. “[John W. Thibaut’s and Laurens Walker’s] research established that people care as much about fairness of the process through which an outcome is produced as they do about the outcome itself. Subsequent researchers such as Tom R. Tyler and E. Allen Lind demonstrated the power of fair process across diverse cultures and social settings. — pp. 117 & 120 (“Fair Process: Managing in the Knowledge Economy“); bolding mine. Mentioned towards the end of the article is that a fair process shouldn’t be conflated with a democratic process. You can have an authoritarian style of leadership and still employ a fair process. By fair process, what the article is referring to are rules-of-the-game that are clear, understood, and based on merit. — p. 134 (“Teaching Smart People How to Learn“); bolding mine. Chris Argyris goes on to mention that changing learning culture in a company needs to start at the top. Reports need to see that their supervisors are living and breathing a different sort of learning, so that they too can feel comfortable with the vulnerability of being wrong. I would add that, apart from higher level management living the learning philosophy they want to inculcate, these managers also must be aware of how they are responding to failure. They need to prove that the employee has no reason to get defensive, because a mistake on its own is not a failure. Mistakes are only failures if you’re not learning from them. — pp. 171–172 (“How [Un]Ethical Are You?“); bolding mine. Most of us aren’t consciously biased. The article assumes as much. It’s not arguing that we are purposefully discriminatory. Rather, it’s arguing that it’s impossible to be subconsciously unbiased because we all have our own backgrounds and experiences that dictate how we associate different things and events. These associations, or patterns, can be wrong sometimes. Someone who seeks to be more aware of these subconscious biases can start to question their assumptions and collect data that allows them to put their beliefs to the test. For example, you can audit your hiring processes and see if there are any patterns which suggest the presence of an unconscious bias. For example, a company that doesn’t consciously discriminate by age may still be hiring candidates predominately from a specific age group. By comparing the data to your assumptions, we become cognizant of these latent biases and can correct them. 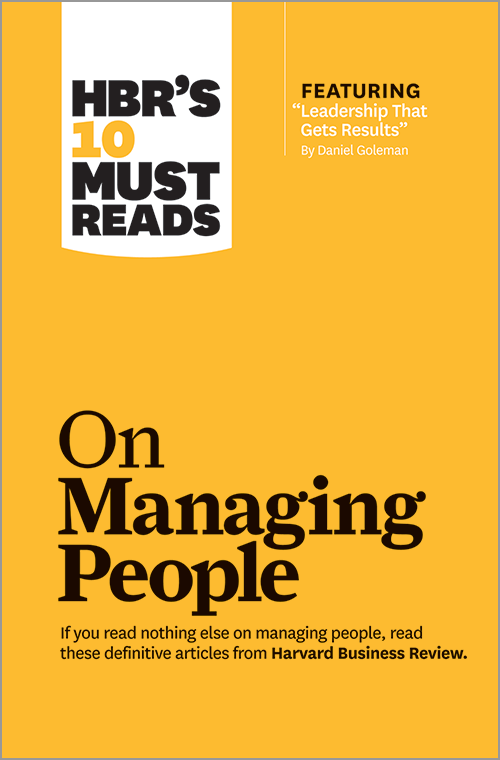 HBR’s compendium on how to manage people is an excellent resource for managers and future managers at all levels. It’s a quick read and deeply insightful. If you like this topic, you may also enjoy “Eating Soup With a Knife: Lessons in Management,” which discusses how teams of specialists can be better coordinated with the bigger picture through the use of smart metrics that hold individuals accountable and in tune with higher level objectives.